Gripping & cutting pain in abdomen. 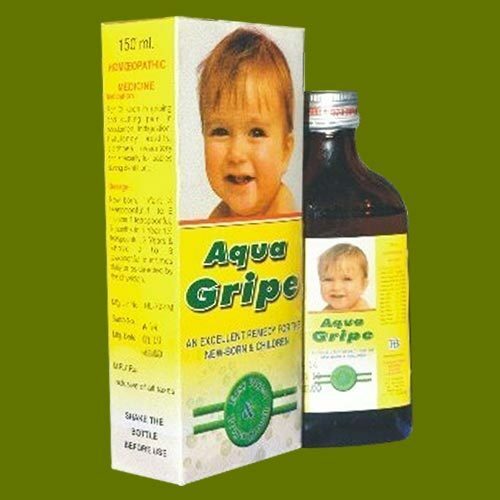 With the assistance of a team of qualified professionals, we are able to offer an effective medicine, which is known as Aqua Gripe Homoeopathic Medicine. Moreover, these medicines can also be prescribed especially for the Babies during the dentition. Leveraging on our experience of 7 years, we have been able to get recognition for our pure and effective Homeopathic and alternative medicines. These include Syrups and Medicines like Aqua Gripe, Alfalfa, Dilution, Mother Tincture, Evesoma, Hepatone, Gastrin and many others. The range of medicines we offer, is known for its necessary efficacy and potency that offer excellent result in the prescribed time frame. Our medicines are prepared in an environment, which is free from dust and bacteria thus enables us to come up with a variety of medicines by following strict norms of homeopathic pharmacopoeias of India. At our organization, we have set up a state-of-the-art formulation unit that has enabled us to meet diversified requirements of the Pharmaceutical Industry as well as Medical Sector. A team of pharmacists and chemical experts working with us, ensures to formulate these homeopathic medicines as per the set industry standards. Our expert quality controllers take responsibility of the consistent quality standards of the drugs and medicines we offer to our customers.